☆ 25μm zirconia ferrules with wide range of fiber optic connector sizes (125μm-128μm) for choice. 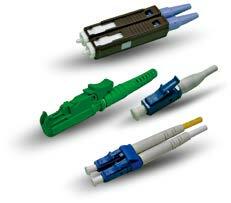 ☆ Fit for single-mode or multimode fiber cables. ☆ Pre-radiused ferrules for fast polishing. ☆ Wide range of the boot colors and diameter for selection. ☆ APC version available for single mode connectors. 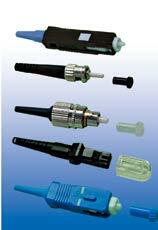 ☆ Fiber Optic Connector Types: 3.0 mm jacketed or 900μm tight- buffered. ☆ Insertion Loss: ≤ 0.15dB (Single mode); ≤ 0.3dB (Multimode). ☆ Available in beige or black colour. ☆ Available for mounting on wall directly. ☆ Available for 12, 16, 24 port terminations. ☆ Metal door with optional lock for security. ☆ Available for FC, SC, and ST adaptor panels. ☆ Compact design with two compartments in one box, one is for incoming fiber cables and pigtails for splicing, and the other is for patch cord terminations. ☆ Housing made of high-strength stainless steel. ☆ Protection standard: IP55, IP65, IP66 for selection. ☆ All cable holes sealed by rubber grommets for fiber protection. ☆ Reliable cable fixing, stripping, grounding and protection devices. ☆ Made of stainless steel for protection against oxidization. ☆ Housing protected by double layer coating gives a shiny and elegant outlook. ☆ Metal door designed to be re-openable for ease of installation and maintenance. ☆ All the cable holes are sealed by dust proof rubber grommets which can be removed easily for fiber splicing. ☆ IP 55/56 rated housing features high tensile strength, weather and corrosion resistance, offering protection against accidental damage. ☆ All the corners of the panels are rounded off and the surfaces are treated with electrostatic spraying for more elegant appearance. ☆ The double layer heat insulating housing improve the heat preservation performance, avoiding water condensation on the surface. ☆ The metal door protected by waterproof lock and 3 point locking system provides a tight seal of the body. ☆ Suitable for ribbon and non ribbon fiber cables. ☆ Clear designation labels for the fiber route. ☆ One enclosure accommodates 12, 24 and 48 port terminations. ☆ Modular adaptor panels for ease of installation and maintenance. ☆ Available for FC, SC and ST adaptor panels. ☆ Slide out feature as an option. ☆ Fit for 19'' Rack Cabinet. ☆ Cable holes sealed by rubber grommets. ☆ High density fiber management, accommodating up to 288 fibers in 4U space. ☆ Splicing tray equipped with inlet device at the front and rear part for ease of installation. ☆ Adjustable clamp ring fit for fixing the fiber patch cord and cables, reducing the tension caused by the use of splicing tray. ☆ Fiber panels are stackable to save space for future expansion. ☆ Fixing device provided for fixation of the cables for maintaining the bending radius of the cables. ☆ Splicing kits provided for direct fiber splicing inside the fiber panel.